PIPE SPRING — Come out with the whole family on Dec. 8, from 4 to 7 p.m. to enjoy Frontier Holiday Traditions with a starlight visit to the historic fort at Pipe Spring National Monument for free. 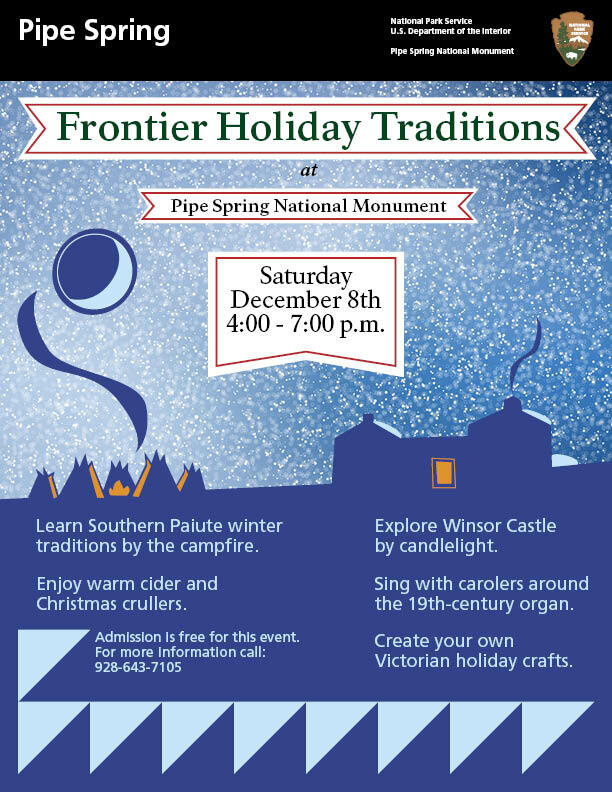 Visitors can tour Winsor Castle decorated in pioneer Victorian style as members of the different Southern Paiute bands share winter traditions around the warm campfire glow or sing along with carolers around a 19th century organ and listen to pioneer and holiday music performed by local musicians while warming up with some hot cider. The Pipe Spring Kaibab Band of Paiute Indians multi-cultural museum will also be open to the public. The museum contains 14 exhibits, displaying artifacts and providing information about the different cultures that used Pipe Spring. Rangers and volunteers will be on hand to help you enjoy creating and designing holiday cards and decorations the old fashioned way. Best of all, no monument entry fees will be charged for this day or event! For more information, call Pipe Spring National Monument at 928-643-7105 or visit their website. Again, Pipe Spring’s entrance fees are waived on Dec. 8. See directions to the event below the video. Pipe Spring National Monument is located 15 miles West of Fredonia, Arizona on AZ 389 or 45 miles East of Hurricane, Utah on UT 59 and AZ 389. Regular winter hours for the monument are 8:30 a.m. to 4:30 p.m. with guided tours of Winsor Castle offered from 9 a.m to 3 p.m. During the event, the monument and grounds will be open until 7 p.m.
More than 20,000 National Park Service employees care for America’s 417 national parks and work with communities across the nation to help preserve local history and create close-to-home recreational opportunities. Visit us at the National Park Service website, on Facebook, Twitter , and YouTube for more information.